What is a Agility Ladder?What muscles does agility ladder work? A successful career in sports requires speed, strength, endurance and mental focus. An agility ladder – also called a speed ladder - is a great tool for supporting both physical and mental agility. What is a Agility Ladder? What muscles do agility ladders work? How to use agility ladder? An agility ladder is a plastic multi-rung ladder that is placed on flat surfaces such as the ground or floor and used for agility training. Agility is the ability to move quickly and easily. Agility is critical for good performance in many sports because it enables one to change direction quickly without losing balance, speed or body control. It is the key to fast response and gives one advantage over the opponent. This inexpensive tool is suitable for use by all: active children, sports people and even elderly people who need to improve their balance and mobility. The use of this tool as part of an exercise routine can improve the balance and stability of elderly people, prevent falls and increase self-confidence. It is also effective in strengthening joints and ligaments. This is a tool that can be fitted into various training regimes because it is suitable for both indoor and outdoor use. As with every physical fitness regimes, it is important to start slowly and increase intensity as one gets fitter. Frequent physical exercise and brain workouts are great ways to strengthen memory and concentration, especially when combined with a healthy diet that is rich in omega-3 fatty acids, antioxidants, vitamins and minerals. Brain workouts refer to actions that expose the brain to new experiences, forcing it to learn new things. These exercises boost the growth of new brain cells, improving overall brain function. Most actions in professional sports require quick thinking. Using an agility ladder helps with this because it requires mental focus and concentration. Exercises such as forward, backward hops or 180 degree rotations which require a high level of mastery call for intense concentration, which is great exercise for the brain. Agility ladder workouts improve foot speed, acceleration and coordination as well as enhancing balance and improving general fitness. 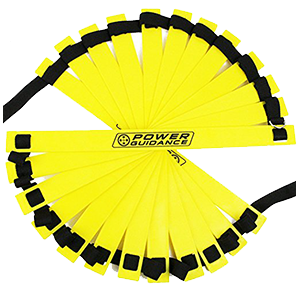 The use of this tool is also good for cardio training, core strength and is a great way to burn fat and get in shape. Sports such as basketball and rugby demand mastery in the ability to move in different directions while still maintaining balance. Footwork drills using the agility ladder are very effective in improving lateral quickness which is very critical for defense in such sports. It is a good tool for footwork training. It is easy to associate an agility ladder with exercises that strengthen the lower limbs, but this tool is useful for much more than that. There are both upper and lower body drills. Upper body agility ladder drills can be used to strengthen the wrists, arms, shoulders, chest, stomach and back. A sports career is a full-time commitment and during peak seasons, one can require almost daily sessions at the gym to work out different muscles. Incorporating a speed ladder in one’s training regime is a practical way for home workouts to replace some gym sessions and also reducing trips to the gym. A person who does not have a personal trainer can achieve training goals by mastering the use of this tool. Weight lifting and other strenuous training regimes require the use of common sense in order to avoid hazards. Learning how to begin with small weights and gradually progress to heavier weights is one way to ensure safety in weightlifting. Warming up and cooling down for each session is critical for avoiding injuries. Effective warm-up is very important for protecting against injuries because it gently prepares the body by gradually increasing the heart rate and increasing body temperature. This loosens the joints and increases blood flow, protecting the muscles from injuries. Jogging or bicycle riding exercises are a great way to warm up. The agility workouts ladder is another practical way to warm up prior to lifting as it works on balance and warms up the hip area. It is advisable to engage in ladder exercises 5 minutes before weight lifting. The ability to kick the ball is not all that requires mastering in soccer. Ball control and speed are critical for a successful soccer career. Soccer practice drills including regular footwork drills have to be mastered before one can become a successful soccer player. 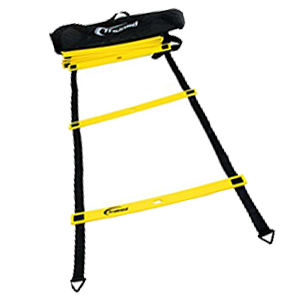 An agility ladder is an important tool in the training routine, and especially if it is combined with other tools such as training cones. There is wide selection of ladders to choose from. There is a lot to look out for when choosing the right ladder for one’s training needs. Size is one area that is important to consider. A team trainer needs to consider the length of the ladder for this is critical. A long ladder - preferably 25 or 30 feet - allows several people to go down the ladder at a go, a great way to train a team. Some ladders come with special clips to allow combining more than one for extra length. Someone who trains indoors such as in the living room might find a shorter ladder a better choice, preferably not more than 15 feet. The overall length of the ladder is not the only thing to look out for in terms of size. The number of rungs is also important? How many holes does it give you to work with? Some ladders have adjustable rungs while others are fixed. Selecting one with adjustable rungs saves one the need to replace it as one becomes more experienced. A beginner will work better with rungs that are spaced widely apart. These can be moved closer as one gets more experienced. It is important to learn how to make the spaces between rungs equal when fixing ladders with adjustable rungs. Customer reviews indicate that flat rungs are considered safer as they reduce chances of tripping while rounded rungs increase the risk of tripping. The strength and durability of the ladder is also important. Generally, straps are made of strong nylon while rungs are made of strong plastic. Strong rungs are preferably made of strong durable plastic that won’t snap or break easily mean that one can use the ladder for a long time. It is good to examine different options and chose one with rungs that will not crack or break when stepped on and the straps that won’t tear or fray with prolonged use. Some get twisted easily requiring frequent replacement and should be avoided. A good agility ladder does not tangle up, is durable and will effectively serve the owner for a long time. Individual needs dictate the right choice of ladder. Some come with spikes or stakes to allow for attaching on soft ground. This might be a good option for someone who trains outdoor but will not work for indoor training. There are pros and cons for each option. Those that don’t attach easily move around when one is using them forcing one to get better to put up with the inconvenience. This could hasten masterly. Some agility ladders are very portable and convenient for people who need to carry them around, e.g. personal trainers who are ever on the move. They are compact in size, easy to set up and put away, and can conveniently fit in a gym bag. Some come with their own carrier bags for ease of carrying around. Some agility ladders are heavy and not convenient to carry around. One that rolls up easily is good for those who are looking for portability. There are various colors to choose from. A person who trains outdoors might find bright colored rungs such as yellow a good choice. This is easy to see on green grass even in foggy weather as compared to an agility rung with a dull color like grey. In reviews about agility ladders, some customers indicated that they did not like the strong smell of plastic that was characteristic of some brands. Everyone should be able to use a ladder in training, even a person who has never used one before. An agility ladder that comes with an accompanying workout plan is especially important for beginners. Some come with training materials such as a DVD or an e-book; a great choice for do-it-yourself training routines. Some brands have YouTube channels that provide guided training. Some come with training cones in the package for more intense training. Cones are especially useful for soccer footwork drills. Can a ladder be good exercise for your legs? An agility ladder is a good training tool for different sports including baseball, soccer, basketball, hockey, football, rugby, badminton, athletics, tennis and gymnastics. Using an agility ladder helps to protect against lower limb injury as it strengthens leg muscles, ankle and knee functions. Some people have been known to use the tool to train dogs. This agility workout ladder is good value for money and has all the qualities of a high value agility ladder. It is 15 feet and there are 3 different sizes to choose from; 8, 12 or 20-rung designs. Both the straps and rungs are very strong and it will not break easily even with prolonged use. The rungs are flat which is very important for safety. It is heavy duty yet portable and comes with a carrying case. To give assurance about its durability, it comes with a 5-year warranty. This is a high-quality but affordable choice that will do everything that a more expensive ladder will do. 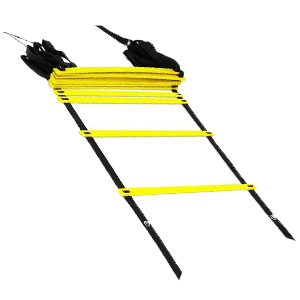 Trained Agility Ladder Bundle is not the cheapest ladder in the market, but it is definitely good value for money. It is a good tool for speed and agility drills, more so because it comes with a lot of extras that include 6 training cones, agility drills e-book and a carrying case. 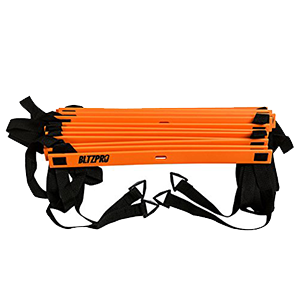 The entire package is highly portable and both the cones and the ladder easily fit into a gym bag or closet. It does not tangle up. It is around 17 ½ feet long with 12 rungs. The rungs are fully adjustable to suit different needs but one downside is that adjusting them is not very easy and can take up some time. The rungs can also move up and down during use which might cause some inconvenience. It is very solid and durable and will give the user good service for a long time. It is suitable for both indoor and outdoor use and it does not come with stakes for fixing on the ground. This is not much of a problem because it is fairly heavy and the rung sit very flat on the ground keeping it firmly in place with or without the stakes. Stakes can also cause a health hazard especially to an inexperienced person or children and so it is not entirely bad that it does not have them. This training ladder is not among the cheap options, but it is very strong and durable yet lightweight. With a length of 15 feet and 11 rungs, it is great for beginners but might not be suitable for expert sports people. It needs to be set up the first time but after that it is easy as one can just pick it up, fold it and pack it away without the need to dismantle it. It is easy to use. The extras that come with this package make it worth its price. It comes with a free footwork ladder drills e-book which makes it ideal for team training. It has an accompanying carrying bag as well as pegs for securing it in place when used outdoors. The pegs are not suitable for indoor use. This is a great choice for both adults and children. It is strong and durable. The rungs are firm yet adjustable. At slightly less than 15 feet and with 11 rungs, this is a great tool for beginners. It is a full package for the benefit of those who might need guidance in their training routines. It comes with 10 training cones, 4 metal stakes for securing it in place when it is used outdoors and a drill e-book which gives instructions and tips. Another amazing extra is that it comes with 2 carrying bags to fit in the cones and the ladders separately. This keeps the entire package in great shape for a long time. It is suitable both for indoor and outdoor use. The 4 metal stakes that come in the package help to secure it in place when used outdoors. This ladder is a great tool for ladder exercises. It has some great extras that include 6 training cones, 4 pegs for fastening it in place when used outdoors and an agility training e-book. It is very portable and comes with a nylon carrying bag. It has 12 rungs that are strong and adjustable. In customer reviews, some customers felt that the cones were rather cheap and not very good value as they did not stay in place very well during training. This 19-feet ladder comes with 12 adjustable heavy duty plastic rungs. It is well made and durable and comes with a carrying bag for ease of portability. It has metal rings at the four ends which come with accompanying stakes for fastening on the ground when used outdoors. It comes with 6 training cones. This is a good bargain. There are 3 options available in the market: 11 feet with 8 rungs, 20 feet with 12 rungs and 13 feet with 10 rungs. All these come at different prices which are all very affordable prices. The low price should not be taken as a sign that the product is not good enough; it can do everything a more highly priced agility ladder will do. It is fairly priced yet strong, well made and durable. The heavy duty rungs are adjustable with the added advantage that they stay well in place when in use. This model has an attractive feature. Both ends have fasteners to conveniently connect more than one ladder for added length. There is a reason for choosing to review this particular ladder last. The product is actually 2 ladders in one; a 30 feet ladder that can be slipped into two 15 feet ladders. There are 11 rungs on each ladder giving a total of 22 runs when the ladder is used as one. This ladder will do basically what any other agility ladder will do, but it is not professional grade, probably because a professional is unlikely to be in need of a 30 foot training ladder. It is not extremely heavy duty and might not be very durable, especially if it is heavily used. The length could mislead one to believe that it is a great choice for use by an entire team but trying that could turn out to be a disappointment. The rungs don’t lie flat on the ground, making tripping a real possibility. Tripping could be a big disaster if the ladder is being used by several people at the same time. The rungs are made of strong plastic but some do snap with repeated use. This product does not do too well in customer reviews, with some feeling that the product’s quality disappointed them. There are complaints that the carry bag is rather small and fitting the folded ladder into it is a struggle and wastes too much time. It probably makes more sense to buy two separate high quality ladders than to buy the two-in-one product. Uniformly spaced rungs are very important for purposes of rhythm. With this ladder, the place where the 2 ladders connect breaks the uniformity of the holes because the rungs are closer to each other than is the case at other places. This does interfere with the rhythm during training and could lead to tripping.